There is something innately American about a July 4th backyard gathering. 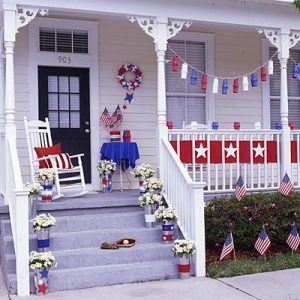 Whether hosted at one home, or shared between neighbors for a block party atmosphere, the outside party to celebrate our country’s independence is a widespread tradition for many families. As we get closer to this year’s celebratory weekend, here are a few must-have’s to make your gathering the best yet. July 4th curb appeal welcomes friends to the party. Traditional décor like bunting, pinwheels, barn stars, and red, white, and blue lights make for a classical welcoming porch that invites neighbors and friends into your July 4th party space. Hanging metal lanterns are very popular this year. Allow the front door to be the focal point, especially if you’ve already chosen a bold color for this feature, and build your decorations out from there. Adding additional splashes of color with potted arrangements on either side of the door or on the far sides of wide front steps brings a celebratory atmosphere all the way to the street and expands the gathering space into the yard. Grilling patios make for effortless entertaining. The best outdoor parties provide multiple spaces for people to gather and move about with ease, and there is no better way to facilitate the natural flow of party goers than having a grilling porch. This is one of the most commonly sought after features of house plans today. Often covered, a grilling porch provides a safe space for a BBQ and a contingency plan in case of rain on your July 4th party day. A designated space for cooking and eating makes hosting an effortless endeavor, and with built in prep space you’ll spend less time running in and out of the house and more time enjoying the time your guests. 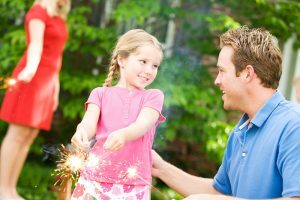 Before the July 4th afternoon gets into full swing, make sure you have planned for the safety of your family and guests before anything might occur. If you live in an area where fireworks are permitted, check with your local fire department for recommended safety protocols. Teach small children at your party about firework safety and let your guests know where to find fire extinguishers or garden hoses. Also remember that explosive sounds can frighten animals into running away, so make sure to keep a close eye on your four legged family members and put them in a quiet spot in the house if they are a flight risk during fireworks shows. This entry was posted in Family Home, Home Buying, House Improvement, Outside Spaces and tagged curb appeal, dream home, grilling porch, July 4th, outside spaces on July 1, 2016 by Admin. Memorial Day weekend is often seen as the opening of the summer season. Bar-be-ques are brought out and dusted off, last year’s grime is scraped away from the grill. Many families will be either hosting or attending some kind of backyard gathering in the next few days, and sharing an outside meal with friends and family. As anyone with a grill knows, finding a proper place for outdoor cooking can be something of a challenge. With this in mind, house plans with built-in grilling porches are soaring in popularity. They are stunning additions to the outside space of your home, designed with both aesthetics and function in mind. Often located at the back of the house, grilling porches are usually connected to the kitchen, making cooking a cinch and movement between food preparation areas as easy as can be. Unique features can be added as well, like windows that open onto counter space for pass-through simplicity, dutch doors between kitchen and grilling porch, and either fully enclosed or partially open porches under full cover from the elements. 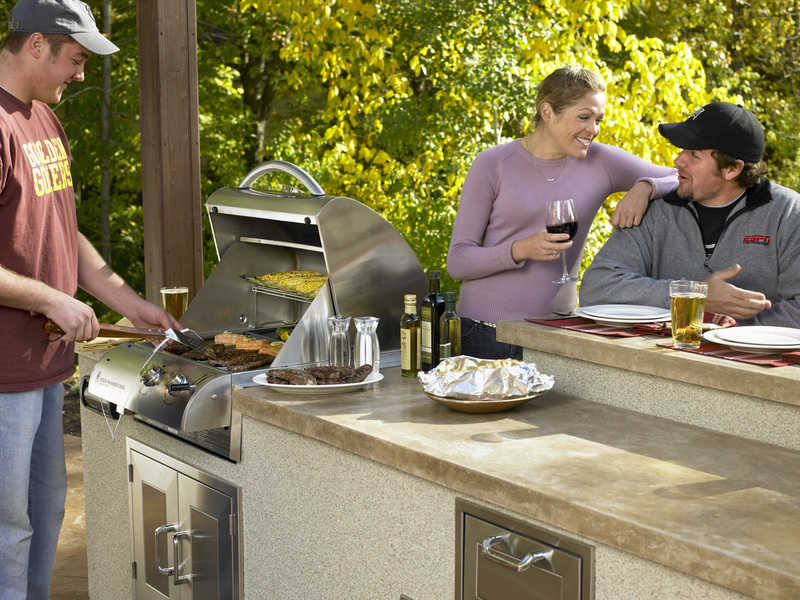 From a safety standpoint, a built in grilling porch is also a safe and efficient way to enable cooking outdoors. With a house plan that includes a grilling porch the standards set forth by the International Code Council governing fire safety in cooking appliances are met to the highest degree. For many people, the benefit of having a professional designer ensure the utmost in safety for outside cooking practices offers enormous peace of mind. Between the aesthetic benefits and the built-in safety considerations, a grilling porch is a must-have for anyone who enjoys cooking out in the open air. Whether hosting large gatherings or simply moving family dinners out of the dining room on a pleasant evening, having someplace designed especially to accommodate a fresh air meal is an affordable luxury and an enviable feature on any dream home project. This entry was posted in Dream Home, Family Home, Floor Plans, Home Buying, Home Floor Plans, Home Plans, House Improvement and tagged grilling porch, grilling porches, home improvement, Outside dining on May 28, 2016 by Admin. Building a home can be an expensive endeavor, and most people preparing to embark on this project are on the lookout for ways to save money- both in the construction phase and in the future years of living in your dream house. The decision to go with alternative energy sources is one that is best made early-on as you browse for floor plans, as the house plan you choose to build from will impact your options for alternative energy sources. Solar panels have been on the commercial market now since the 1950’s and recent developments in technology have greatly improved the efficiency and storage capacity of solar panels. Versions of this technology are available in hundreds of smaller products, in everything from landscaping lighting options to solar cell phone and tablet chargers. But solar panels on the roof of your new home can save you hundreds of dollars each year in utilities and reduce your dependence on traditional sources of electricity. Forbes magazine estimates that installing solar panels of your roof can reduce your family’s carbon footprint by as much as 35,180 pounds of carbon dioxide each year, doing the work of 88 trees. For those interested in green structures and efficient houses, this is an impressive statistic. And with so many people interested in this option, there are now several ways to go about it. Many companies will lease solar panels and include installation in the overall cost of the agreement. The benefit of this arrangement is mostly financial, as the company who leases the equipment stores the electricity and sells it back to the consumer, often at a lower rate than the electrical company. For some, installing permanent solar panels will be the best option. There is an initial cost investment in the materials and the skilled labor required to install them, but you can expect to begin recouping that investment right away. Electricity can be harnessed to power lights, heat, hot water heaters, swimming pools and hot tubs, and any other electricity-based appliance. Solar panels are also estimated to increase the resale value of your home by as much as 20%, so for many home builders it is a worthy venture. This entry was posted in Dream Home, Family Home, Floor Plans, Home Buying, Home Plans, House plans, News, Small House Plans, Uncategorized and tagged dream home, house plans, money saving tips, solar panels on May 23, 2016 by Admin. Too often the dream of building a custom home is catered to those with a growing family. Spaces for children and/or aging parents and in-laws dominate ads and idea boards, and the vision of home owners is guided to a bigger-is-better mentality. But the dream of building a custom home is suited for everyone, no matter the size of your family, the lot you purchase, or the location you choose. Smaller homes make sense in areas with dense populations and high property taxes. For the working professional, or the retiring couple, or the investor interested in long term returns, building a small house can be approachable, efficient, and lucrative. Modern small houses are marvels of clever creativity. There are a million ways, it seems, to maximize space and visually expand it so you can have the best of both worlds: a collection of rooms magnified for airiness and light, yet without the burden of superfluous space. Function drives the vehicle of decision-making but not at the expense of aesthetics. For many, then, sometimes the preferred solution is to limit available space to only that which is required. This forces a thoughtful discretion when purchasing items for the home, and urges a careful vision when designing the space. By considering building your dream home in subtle proportions, possibilities are opened up that are difficult to manifest with larger homes, like the option of building on lots in urban spaces, already perked, and zoned for residential construction A larger home requires a larger lot and, with today’s exponentially growing populations, this will often relegate your property purchasing options to the periphery of a large city. And while the suburbs are wonderful areas for families, there are many who would build their dream home much closer to the epicenter of activity. As you sift through house plans and imagine the home you will someday build, try to remember that there is room in this process for every vision. Whether you seek to build a large home or a smaller one, you will find unique floor plans and advice from architects for dream homes of every size. This entry was posted in 3D House Plans, Dream Home, Family Home, Floor Plans, Home Buying, Home Floor Plans, Home Floor Plans, Home Plans, Small House Plans, Uncategorized and tagged dream house, small house on May 23, 2016 by Admin. Patio: A patio is defined as a paved outdoor area that is adjoining a house or structure, usually without a protective roof overhead. This is quite simply a concrete or brick area usually at the back of the house between the house structure and the yard beyond. Veranda: A veranda, in contract, is a roofed platform along the outside of a house and level with the ground flood. The platform can be made of wood or, like the patio mentioned above, can be concrete or brick. Porch: A porch is a covered structure projecting out from the front of a house or structure, almost always with a door into the main house. The building materials often vary widely, as do the stylistic considerations with elements like railings, stairs leading to the yard, and overall look of the structure. Porto-cochere: This features comes from the French Country House style, as seen in this week’s Plan of the Week. A covered area between the main house at the front and a gate house-type structure, it historically provided a shelter from the weather to visitors disembarking from vehicles. Still used often in commercial hotels, porto-cocheres are usually made with natural materials such as stone or mason work and are a beautiful blend of function and a rustic elegance style. Gazebo: A gazebo is a separate structure on the property but not attached to the main house. A stand-alone roofed area often with a low railing all around, gazebos are almost always built in a circular pattern and offer 360 degree views of the surrounding landscape. Pergola: A pergola is a stylized structure most often seen surrounding a garden space. It is tall and with an open area above, often used as a support for perennial vining and trailing plants such as wisteria. Some of these structures can be added once the house is built, but some of the others require working with your designer at the house plan stage of this project. It is important to have an idea of how you envision spending time outdoors at an early stage of your dream home project, as many of these options are included in the house plan and designer you choose to work with. This entry was posted in Dream Home, Family Home, Home Buying, Home Floor Plans, Home Floor Plans, Home Plans, House Improvement and tagged outside spaces on May 15, 2016 by Admin. In a world full of conformity and sameness, there are many opportunities to show your unique vision through your dream home project. Creative solutions to common problems are the specialties of many architects, and these types of issues that require them to accomplish something typical in a new and fresh way is often the bread-and-butter of a design assignment. Some of these creative decisions do not require expert guidance, however. Consider that the street view is the first impression your home makes to your family and your guests alike. Curb appeal is a big deal at every stage of your dream home project: it is important in everything from the way you feel as you walk up the front steps and insert your key into the door to the potential increase in overall home value to potential buyers by drawing them in. Your front door says a lot about your family. For many home builders and home owners, a front door is the single most effective way to make a strong aesthetic statement. It is the perfect bend of beauty and function, as the front door is your welcome statement and also serves some very important purposes. In addition to serving as the entrance space for your home, your front door is also a security feature. When considering an artistic flair for your door, make sure that the basic functionality remains intact. While fancy plate-glass windows might appeal to your decorative sense, you do sacrifice some privacy aspects that a door can provide, and that might not be the best idea in high traffic areas. Dutch doors are quirky and wonderful, but are often preferred in the back of the house as they offer a more intimate entry into your home space. As you choose your front door to perfectly accent the façade of your dream home, look for ways to balance beauty and function. Often the most aesthetically pleasing choices are embodiments of these two elements in harmony. This entry was posted in Dream Home, Family Home, Floor Plans, Home Buying, Home Floor Plans, Home Plans, House Improvement, House plans, News, Small House Plans, Uncategorized and tagged Creative, dream home, Front Doors, Home Design on May 10, 2016 by Admin. As these first warm evenings of a warm springtime begin to occur, many of our families feel the urge to take our dinner plates outside and enjoy this in-between season. When it comes time to plan for your outside eating space, there are many things to remember in order to prepare for the best use of your space. Does your chosen house plan boast a large porch or desk area? Is it an enclosed patio, or is there merely an overhang? Features such as these are worth considering in preparation for a time when you’re faced with bothersome insects, or rain fall on a pleasant evening. If you enjoy playing the host, consider building a deck or patio area that can not only support many people at a time but is also in close proximity to the kitchen for ease in dinner service. These modified porches make entertaining a simple and enjoyable affair by providing ample space for preparing and serving meals; rather than running back and forth from the house to the patio, your time is freed up to focus on your guests and the meal you are serving. By thinking of these spaces as extensions of your home you become empowered to evolve an evening out into the yard with ease. Whether it’s a simple dinnertime affair on a weeknight or a larger celebratory event, expanding your home area to include your outside space is one of the very best ways to maximize your investment with adaptive spaces. This is just the beginning of the season of longer days and hotter temperatures. Whether you’re escaping the heat of the house in the afternoon or taking in a cool evening breeze, remember how you will use your yard and porch spaces when choosing your dream house plan. With a bit of foresight, these areas can be built in conjunction with your house project, saving money and time in the long run. 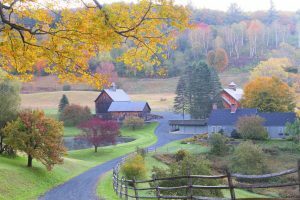 This entry was posted in Dream Home, Family Home, Home Buying, Home Floor Plans, Home Plans, House Improvement, News, Small House Plans, Uncategorized and tagged Decks, dream home, Outside dining, Patios, Porches on May 10, 2016 by Admin.